When you hear your coach shout “engage the core”, they usually mean “squeeze” all your muscles, as hard as you can but don’t forget to breathe, around your back, hips, neck and the belly. In complex movements, such as squats, not engaging the core also means not being able to lift the burden or getting injured. In everyday situations, weak core relates to chronic pain and higher risk of injuries. Simply explained, core includes the muscles around our belly, back, hips and the neck. More detailed description would include the muscles known as erector spinae, the diaphragm, rectus abdominis, transversus abdominis, multifidus, internal and external obliques and the pelvic floor muscles. Core’s main function, especially emphasized in the fitness industry, is the spine stability. 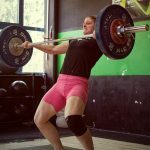 Herniated disks and pinched nerves are a very common injury that can easily be prevented by taking smart decisions when it comes to barbell loading and building a strong foundation: core strength and a proper technique. Simply said, core’s task is to keep your body stable; not only during the training, but also during the situations such as accidents, sudden falls and crashes. Core is also often labelled as a source of power; when engaging all core muscles at the right moment, our body has the ability to produce a much greater force. While you move, let’s say squat up from a hole, if you “squeeze” your core, you’ll be able to generate more power and lift the weight, first safer, and second, in a more powerful way. Strong core will also make sure your posture stays aligned and upright, and make your 8-hour office time, sitting behind a computer, much less painful. Good stability prevents many of the work, sitting or physical, related health issues such as chronic pain or overuse injuries. Besides the ladder, core muscles also have a role in the continence, pregnancy and holding a breath. As you see, core workouts and a strong midsection are important. First thing first; no sit ups or crunches. We will keep these highly popular exercises out as they simply don’t belong into our core workouts plan. The following routines are put together in a way you can do them practically anywhere, that includes at home. Important: keep you core activated/engaged. That said, don’t let the lower back curve into a hyperlordosis; don’t let your pelvic muscles loosen up too much. If the workout still appears too demanding, scale it. The single, most important goal of the following routine is to keep the core activated; prevent the anterior pelvic tilt. 1 minute break in between the rounds. The most important task is to keep your core engaged and your form, especially the lower back, solid. Balance, try to keep your eyes closed: stand on the left leg (hold the right knee with your hands). 20x side twists (Stand still, bend your knees slightly, hold the kettlebell in front of you. Move the kettlebell left and right while keeping your hips fixed – no movement, hands only). 10 reps with each arm: plank + pull; while holding a plank, pull the band with your arm from the front (overhead) position all the way to the hips. The second arm supports the plank. Squeeze your core and the glutes to keep your body straight and stable. To scale the exercise, place your knees on the floor. Pair the movement with hollow rocks: 15 reps.
12x overhead front raises; grab the plate, kettlebell or a heavy object and lift it from the hips to the overhead while keeping the elbows (almost) straight. Medicine or slam balls are a great training tool that can also be used at home (preferably outside on the backyard). Make sure you engage the core while slamming the ball down or sideways. In case you do like planking, here’s a routine that will definitely test how pain resilient are you. If at any time, your plank or push up form breaks down, take a pause and continue after you are once again rested enough to keep your (lower) back straight. A quick test of how engaged or strong your core is would be to perform a pull up, or a push up. Observe your back; did your feet stay in front, or did they sway backwards?